Fads fade. Trends take us in new directions, and give us a glimpse of what’s next. Here are seven current trends that are changing the form, function and future of Northwest homes. According to the world’s leading platform for home remodeling and design, Houzz.com, nearly half of us remodel to prevent potential health problems. Whether it’s non-VOC finishes, no-formaldehyde cabinets, or better air filtration systems, homeowners realize a benefit to the family in creating a healthy living space. Trend #3: Reduce, Reuse, Recycle. Maybe the recession taught us something. Or maybe people would rather scratch their fingernails on a chalkboard than move. Either way, an emerging housing trend is that more and more folks are opting to remodel their existing home than move to a new one. Clearly every situation is different, but many sources confirm that more folks are discovering it’s less expensive and more satisfying to stay than go. Four hundred designers couldn’t be wrong, right? Well, sure they could, but not about this trend. According to the National Kitchen and Bath Association’s style report, designers agree there is a move toward simplicity in a cleaner, more contemporary design. Say goodbye to rustic and hello to a more minimalist modern groove. 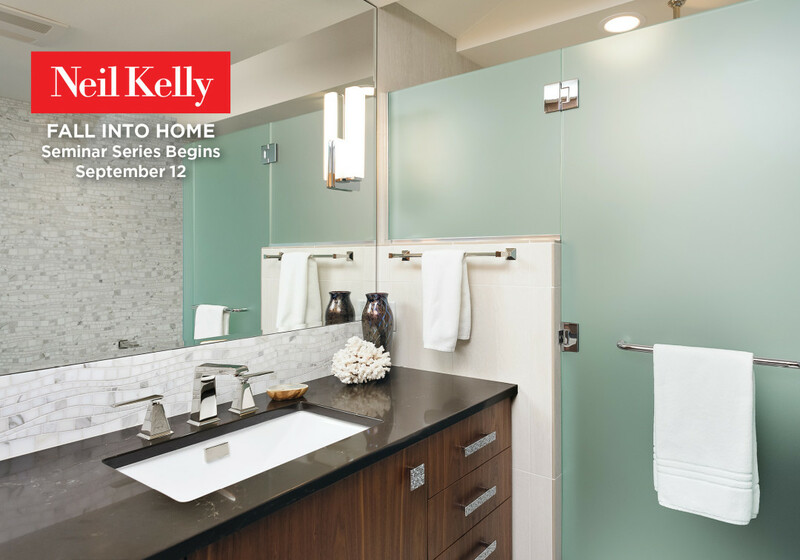 If you’re thinking about what’s next for your home, you’ll find inspiration, information and fun at Neil Kelly’s Fall Into Home September Seminar Series. From kitchen and bath remodeling trends and best practices, to whole-house remodeling and historic home renovation, to energy efficiency retrofits and solar energy systems and programs; the Fall Into Home Series will address a broad range of home improvement and remodeling topics, all presented by Neil Kelly’s experienced designers and home energy experts. See the complete schedule and RSVP www.neilkelly.com/events.